Next generation storage for computers are here now, it is called SSD-solid state drives. In a simple way the difference of it from HDD- hard disk drives is that it does have any mechanical parts which means, takes less power,will be cooler than HDD, fast data transfer, shock proof, quiet and as always for new technology high on price. In technical way it uses NAND based flash memory which is reponsible for all its features. OWC(other world computing ) offers a quiet rang of SSD's for 2010 MacBook Air 11.6 and 13.3 inch. The company announced that these storages come under Mercury Aura Pro Express line in Airs, in 180 GB, 240 GB, 360 GB, and 480 GB. Accroding to OWC it is the high performance drives, it will make the MacBook Air to perform 68% faster and its peak data transer rate is touching 275MB per second. Accroding to company this new line SSD's won’t suffer from transfer speed reduction with heavy use.The drives offer chip-based data encryption, and use SandForce RAISE (Redundant Array of Indepedent Silicon Elements) technology to provide RAID-like protection without a performance hit. The 180GB will cost you $480 and the 480GB is for $1580. 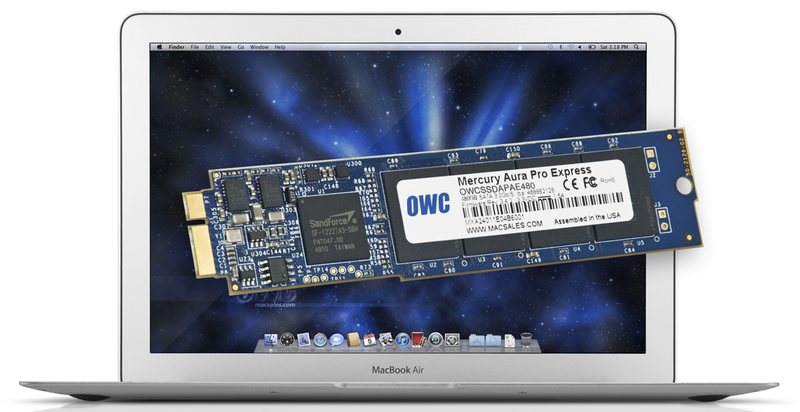 Tags:OWC SSD, what is ssd, what do you meant by solid state drives ?, MacBook Air, MacBook Air 11.6, MacBook Air 13.3, Mercury Aura Pro Express, Mercury Aura Pro Express SSD, Mercury Aura Pro Express SSD features, Mercury Aura Pro Express SSD price, Mercury Aura Pro Express SSD review, Mercury Aura Pro Express 180GB SSD, Mercury Aura Pro Express 480GB SSD, Mercury Aura Pro Express 360GB SSD, Mercury Aura Pro Express 240GB SSD.